Ooh, the Swiss Pub Burger has no cheese at all listed in its ingredients; maybe it’s a pub burger in the Swiss style, or a burger of the sort you’d get at a Swiss pub, but either way, it looks like an appeal to Swissness. Maybe it’s the mushrooms; mushrooms are big in Switzerland. But no, Swiss here is just a beheaded version of Swiss cheese. 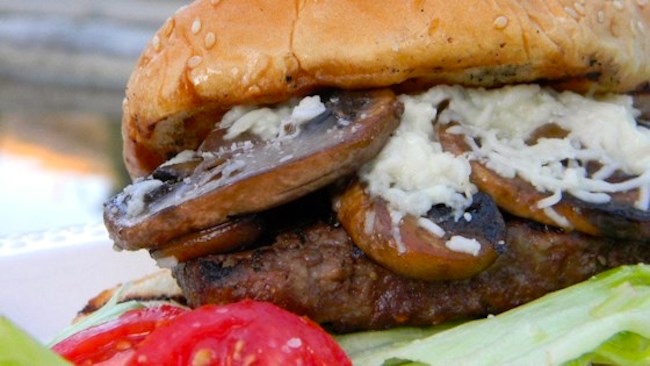 The burger does in fact have cheese — Swiss cheese — on it. Then why isn’t Swiss cheese in the ingredients list? Answer: because the word Swiss is in the name of the burger, and we’re supposed to understand that in un-fancy food contexts in the US — these restrictions are crucial — Swiss by itself always entails the involvement of Swiss cheese. Then, since Swiss is in the name of the menu item, it is unnecessary in the list of ingredients: Avoid Needless Words, as Will Strunk has been instructing Americans for a hundred years now (eventually in the extremely influential Strunk & White Elements of Style of 1959). 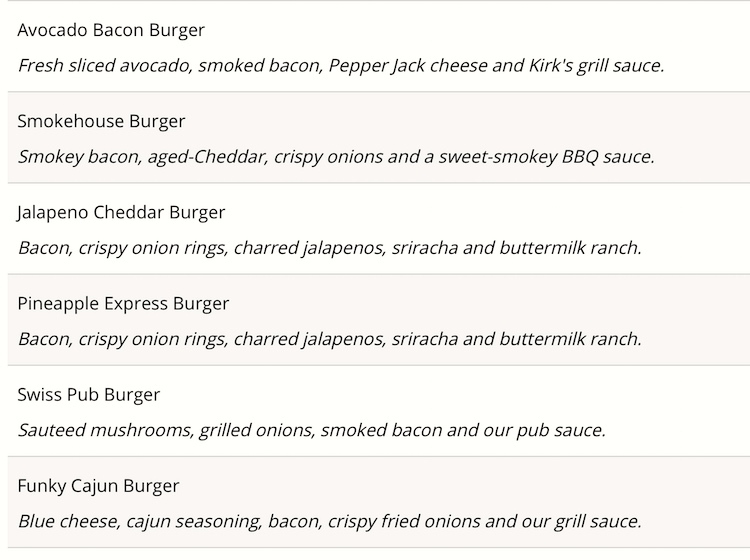 In the Kirk’s list in #1, compare the Swiss Pub Burger with the Jalapeno Cheddar Burger, whose list of ingredients similarly fails to include a mention of cheese — surely because Cheddar in English always entails some involvement of Cheddar cheese or its simulacrum. Contrast the Avocado Bacon Burger, the Smokehouse Burger, and the Funky Cajun Burger, whose lists of ingredients do include cheese (Pepper Jack cheese, aged Cheddar cheese, Blue cheese, respectively) — because there’s no cheese in their names. And note that the Pineapple Express Burger (which actually has no cheese, so there’s none mentioned in the name or the list of ingredients) does have pineapple bits in it, but has no pineapple on its list of ingredients, because that would be unnecessary. Alas, Kirk’s fails to be relentlessly consistent in avoiding unnecessary menu words: the Avocado Bacon Burger has both avocado and bacon on its list of ingredients, and the Jalapeno Cheddar Burger has jalapenos on its list; smokey bacon in the Smokehouse Burger and cajun seasoning in the Funky Cajun Burger strike me as borderline cases, but the ingredients lists for the Avocado Bacon Burger and the Jalapeno Cheddar Burger have straightforward redundancies. Well, nobody’s perfect. 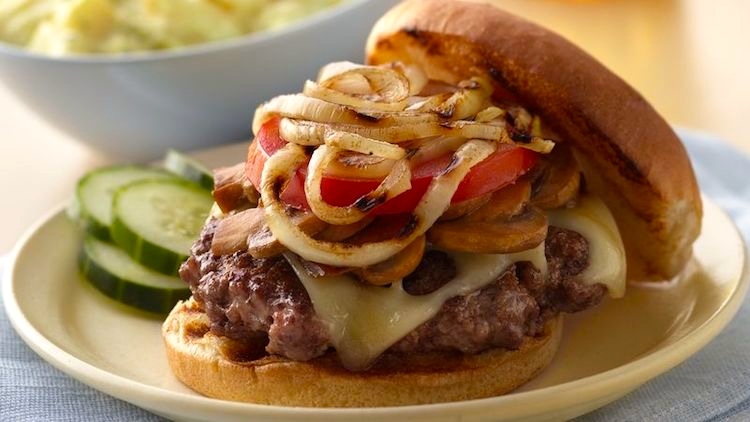 In the American burger world, Swiss cheese and mushrooms have a strong affinity for one another. The mushrooms are almost always the standard American mushrooms of commerce, the variety of Agaris bisporus known as white mushrooms or button mushrooms (but most commonly just as mushrooms). Gruyère is a hard yellow cheese that originated in the [Francophone and French/German bilingual] cantons of Fribourg, Vaud, Neuchâtel, Jura, and Bern in Switzerland. It is named after the town of Gruyères [in Canton Fribourg]. Before 2001, when Gruyère gained the appellation d’origine contrôlée … status as a Swiss cheese, some controversy existed whether French cheeses of a similar nature could also be labelled Gruyère (French Gruyère-style cheeses include Comté and Beaufort). 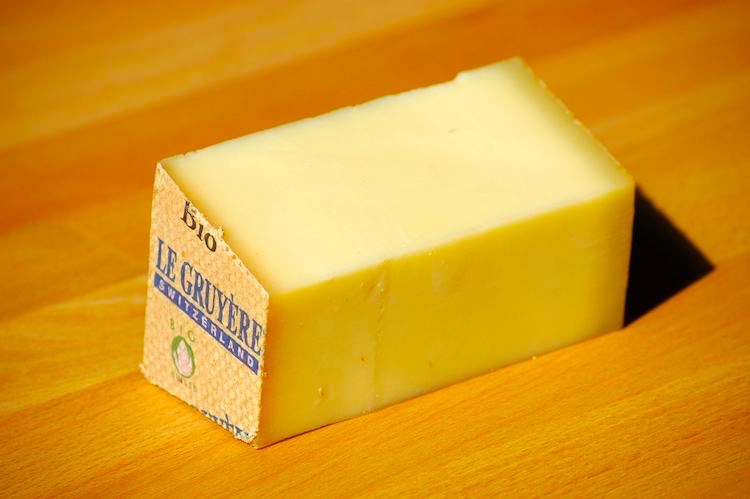 Gruyère is sweet but slightly salty, with a flavor that varies widely with age. It is often described as creamy and nutty when young, becoming more assertive, earthy, and complex as it matures. When fully aged (five months to a year) it tends to have small cracks that impart a slightly grainy texture. Gruyère cheese is generally known as one of the finest cheeses for baking, having a distinctive but not overpowering taste. In quiche, Gruyère adds savoriness without overshadowing the other ingredients. It is a good melting cheese, particularly suited for fondues, along with Vacherin Fribourgeois and Emmental. It is also traditionally used in French onion soup, as well as in croque-monsieur, a classic French toasted ham and cheese sandwich. Gruyère is also used in chicken and veal cordon bleu. It is a fine table cheese, and when grated, it is often used with salads and pastas. The name eggs à la Suisse has also been used for eggs Benedict with Swiss cheese, otherwise known as a Swiss cheese Benedict or Swiss (eggs) Benedict. The modifier à la Suisse ‘with Swiss cheese’ also occurs in a recipe for “cardoon and carrots à la Suisse” from Frieda’s, an American company specializing in exotic ingredients. The recipe summarized: simmer sliced cardoon (or celery) and carrots in chicken broth until tender and then drain; make a roux, add some of the cooking liquid and milk, to make a sauce; add shredded Swiss or Gruyère cheese; when it melts, pour sauce over vegetables; sprinkle with more cheese and brown under a broiler. Once again: Swiss or Gruyère. And we continue the slide towards genuine Swissness. The next step with à la Suisse dishes takes us fully into Swiss territory: variants of and relatives of cordon bleu dishes, fondues, and sautéed émincé of meat dishes in cream sauces. Those for another posting, since I’ve already drifted far from burgers and avoiding needless menu words. This entry was posted on July 18, 2018 at 8:49 pm and is filed under Abbreviation, Ellipsis, Language and food, Switzerland and Swiss things, Usage advice. You can follow any responses to this entry through the RSS 2.0 feed. You can leave a response, or trackback from your own site. I suspect the burger description writers had style constraints they were adhering too as well, like maybe needing to include a minimum of 4 ingredients for the rhythm even if that meant repeating ones in the burger name. Also striving for similar length in the descriptions resulting in more or less verbiage, viz. ‘smoky bacon’ vs ‘bacon’. Having just written a bunch of descriptions for Master Gardener plant tags, I’m rather sensitized to needing to make modifications based on text length. Have you already noted the usage of ‘buttermilk ranch’ sans ‘dressing’? Tomato Salad with Ranch: Creamy ranch is good on everything you put it on, but on perfectly ripe tomatoes it’s sublime. As for shrimp scampi, there’s no redundancy here. From Wikipedia: “Scampi, also called Dublin Bay Prawn, or Norway Lobster, (Nephrops norvegicus), is an edible lobster of the order Decapoda (class Crustacea).” That’s not a shrimp (as you’ll know if you’ve tasted the real thing), and a dish that involves shrimp prepared in more or less the way Italians prepare scampi has to say so.